Typically, home owners who lost their homes to a short sale or foreclosure are required to wait about 36 months before being able to purchase a primary residence again with a Federal Housing Administration loan. 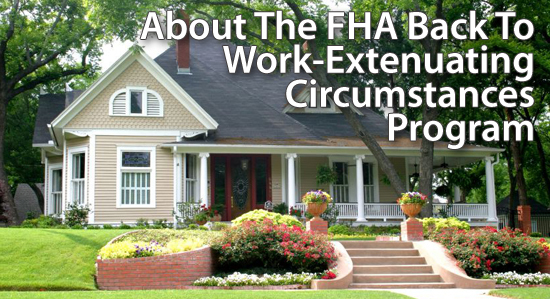 But the FHA’s Back to Work Program is allowing buyers to purchase a primary home much sooner — possibly as soon as 12 months following a short sale, foreclosure, or deed in lieu of foreclosure. The program runs through Sept. 30, 2016. To qualify for the program, potential buyers will need to document the financial problem that prompted their short sale or foreclosure, such as showing a 20 percent loss in income for at least six consecutive months prior to losing the home. Buyers will also have to show that they have taken steps to re-establish their income and credit (having a credit score of at least 640 or having undergone a HUD-approved counseling agency program on home ownership or residential mortgage loans). The program does not consider divorce, previous loan modifications, or adjustable-rate loan recasting as reasons to qualify. With conventional loans, boomerang buyers are typically eligible to buy again seven years after a short sale or foreclosure, or possibly three years with sufficient documentation of the circumstances and a lender exemption. FHA, VA, and USDA all offer opportunities for boomerang buyers to repurchase 36 months following a short sale or foreclosure.